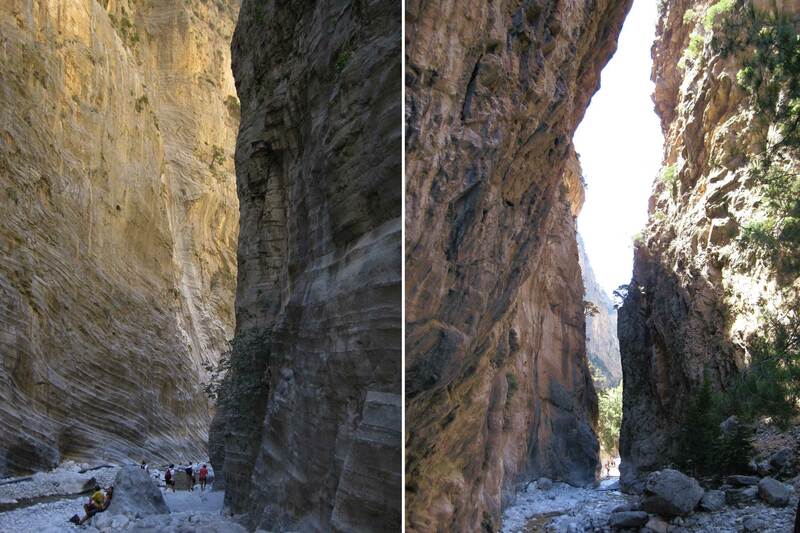 Known locally as Farangas or Great Gorge, Samaria Gorge is a 16-kilometre hike that winds through one of the longest and most striking gorges in Europe, within Crete’s only national park — Lefka Ori National Park. 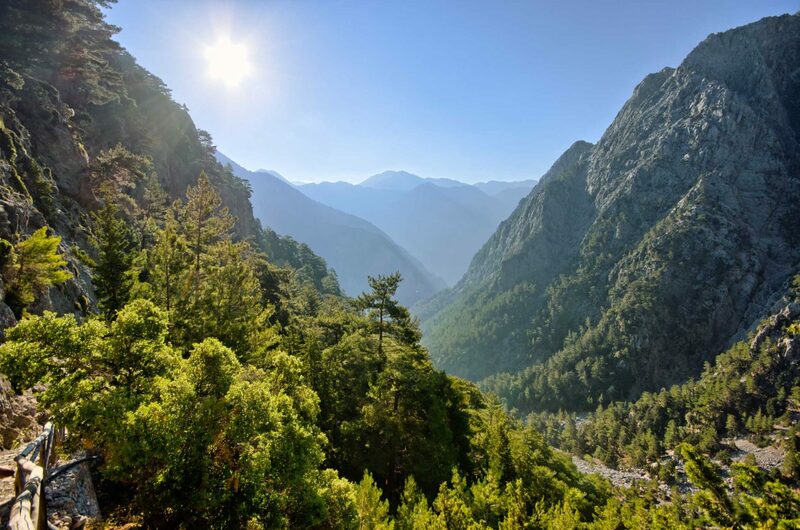 Samaria Gorge is a World Biosphere Reserve and has been a National Park since 1962. Located in the southwest of the Greek island of Crete, the gorge was created some 14 million years ago by tectonic movement and the subsequent erosive action of the Tarraios River. The gorge trailhead is located at the tiny settlement of Xyloskalo on the plateau of Omalos. This is at an altitude of 1230 metres above sea level and around 43 kilometres from the city of Chania. 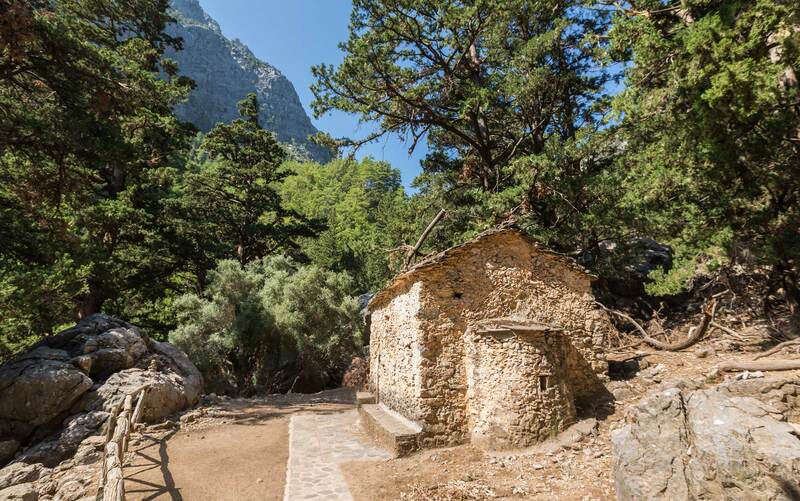 The Samaria Gorge trail initially zigzags steeply downhill through flourishing pine and towering cypress trees before passing the deserted settlement of Samaria, among other religious sites. The initially expansive gorge walls narrow to just three metres wide towards the end of the trail, around three kilometres short of the coastal village of Agia Roumeli on the Libyan Sea. Taking between 4-8 hours to complete, depending on fitness levels, an early start is advised in order to avoid as much of the midday sun (and crowds) as possible. The trail is clearly marked with motivational kilometre posts dotted along the route. Friendly and knowledgeable rangers are strategically positioned to offer guidance, and numerous toilets with water stations allow hikers to fill bottles and cool off. Terrain: The trail starts with a steep and swift descent along a smooth stone path, which features regular switchbacks and a wooden handrail. The smell of dense pine forest wafts on the breeze, strongest at the beginning of the summer when the sap starts to run. At times the trail becomes more of a forest path, easier underfoot than the stony ground. The craggy peaks of Lefka Ori, or the White Mountains, can be glimpsed through the trees, appearing even taller as the trail quickly descends. The church of Agios Nikolaos marks the end of the first section of the trail. This tranquil spot is a good place to take a quick rest. Tips: The trail descends around 700 metres over the first two kilometres. This is a steep, knee straining exercise, so using the handrail is advisable. Three toilets and water stations appear at 1.7, 2.9 and 3.9 kilometres along the track. Terrain: The trail gently slopes downhill, along the rocky floor of the gorge. The route regularly crosses the river by means of a small wooden bridge or by walkers picking their way across the exposed rocks at the narrower parts of the gorge. Over 450 species of plants and flowers can be found on this part of the trail, including the paper-thin magenta Cistus Creticus and the Paeonia Clusii with its fluorescent pistil. It is forbidden by law to pick them. The grey rocky trail contrasts with the verdant green of the cypress trees while the walls of the gorge turn from grey, to red, to ochre. Visitors might see the hares, lizards and snakes that frequent the valley floor or be lucky enough to catch a glimpse of the rare bearded eagle. 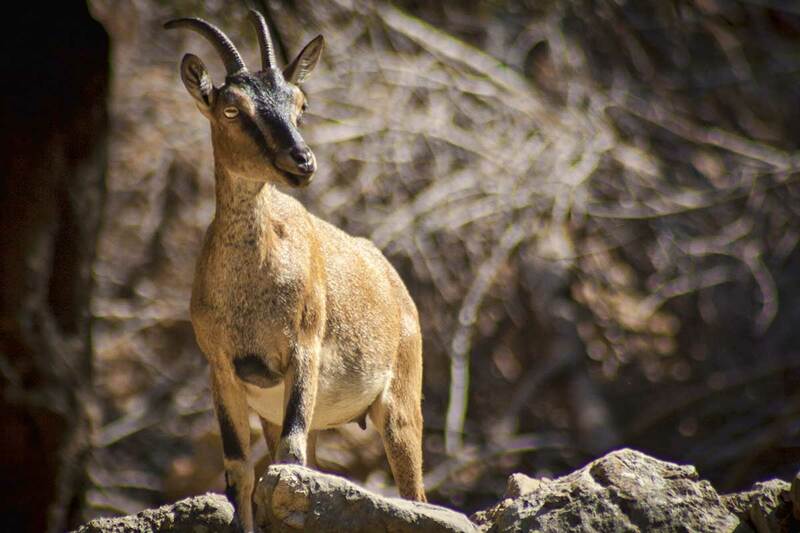 Around the 8-kilometre mark, chestnut-coloured native kri-kri goats appear. 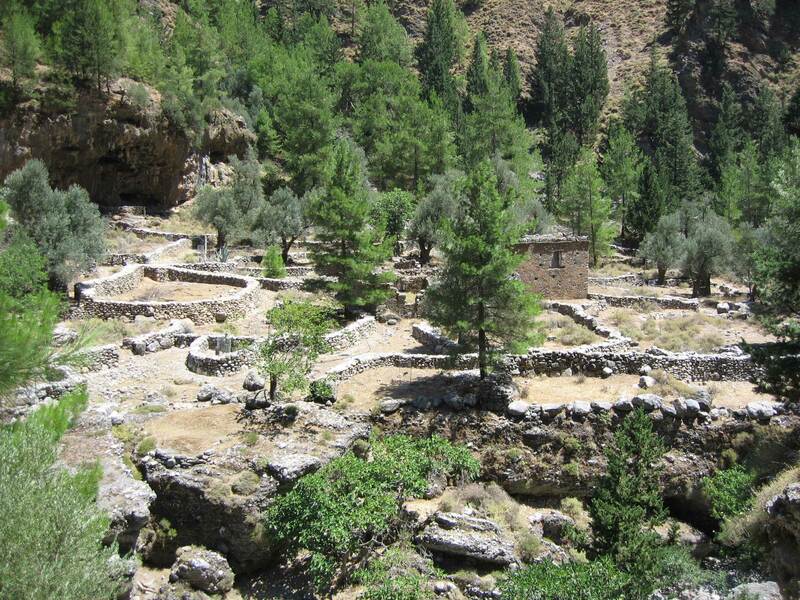 Also around the 8-kilometre mark appears the deserted village of Samaria with its pretty 14th-century church. The single-storey buildings are rustic, with some of the buildings being repurposed — the old olive mill house is now an information centre and a larger building acts as the Samaria National Park Administration and Health Centre. Samaria’s last inhabitants were relocated when the gorge was designated as Crete’s only national park in 1962. Tips: The water fountain and shaded benches at Samaria make it the perfect spot to stop and soak up the atmosphere and have lunch. It is inadvisable to take a rest break in the shade at the foot of the gorge wall due to the risk of falling rocks. There are four water taps at 4.7, 6, 7.1 and 7.8 kilometres along the track, toilets at the latter two. Note that there are no medical facilities or shops here. Terrain: From Samaria village the track follows the river towards the 11-kilometre marker, which is the most dramatic section of the trail. As the gorge continues to narrow, each wall becomes a vertical sky-scraping monolith up to an imposing 500 metres high. 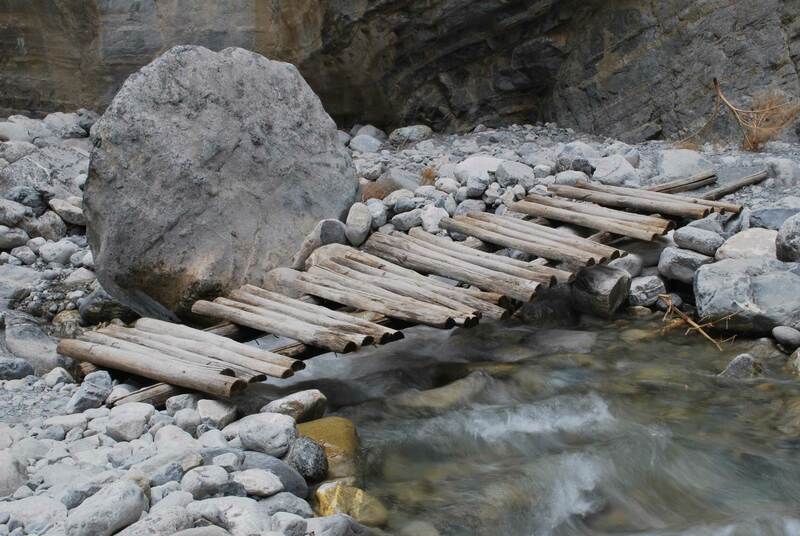 The path criss-crosses the river in dozens of places, sometimes by makeshift bridges, drift logs or freestyle from rock to rock. The tall trees here give some peripheral shade but there are many open barren stretches of sun-scorched rocky floor. The gorge becomes so narrow that the sides appear to meet, which means the trail moves into the cooling shade. At the 11-kilometre mark is Christos, and the last drinking water in the gorge. The lower part of this section of the gorge offers relatively easy access to the sea port and mules are likely to be seen being led in this area, as they are used for delivering supplies to Samaria village and also as emergency transport for injured hikers. Tips: Various deviations from the main gorge trail can be easily and safely explored if time and energy levels permit. This can also be an easy way to lose the crowds for a while, if caught up in a bottle neck of hiker traffic. Two water taps are available at 10 and 11 kilometres along the route. Terrain: From Christos, the gradient is imperceptible as the trail criss-crosses the river towards the gorge end. In the summer the crossings are easy, however in spring and autumn with the river flowing fuller it is necessary to use the bridges and boardwalks. Just beyond the 11-kilometre marker is the Sideroportes or Iron Gates. The is the narrowest part of the gorge — measuring just 3 metres across — where twists in the trail can give the false impression of a solid curtain of ancient rock blocking the way ahead. For the final two-kilometre stretch hikers will encounter people taking the ‘easy gorge walk’, visitors who have arrived by boat to the ferry port to take a stroll into the gorge before returning to the ferry back along the main route. Tips: The name ‘Iron Gates’ actually has no meaningful translation, or even a known origin. The gorge has been used as a defensive site throughout its human history so gates or doors may have once existed at this easily defendable point. Terrain: The final downhill stretch after the park exit is possibly the most tiring part of the walk, as it leads out of the gorge proper and is exposed again to the overhead sun. The gorge walls quickly part, giving way to the unmistakable marine vista and a welcome sea breeze. The coastal village of Agia Roumeli soon appears and a well-earned swim in the refreshing Libyan Sea awaits. Tips: Despite being out of the gorge the terrain underfoot remains uneven and care must be taken, especially considering weary legs. The village of Agia Roumeli has many shops and tavernas where meals and drinks can be purchased. However, there is only one ferry a day which leaves Agia Roumeli in the late afternoon, so for those not on a pre-booked tour, it is imperative to buy a ticket (outlets well-advertised) and listen out for the ferry’s horn. The boat ride to Sougia takes about an hour and is a wonderful time to reflect on what is likely to be the most memorable day of any visit to Crete. Holidaymakers who are not regular walkers can still undertake the hike, provided they have a reasonable degree of fitness and appreciate that there will be some aching muscles the next day. Keen hikers should not miss the opportunity. The gorge opening times are dependent on the weather but generally run from April to the end of October each year. During this time the number of walkers in the gorge varies from a few hundred to approaching 2000 per day. Virtually all of the walkers choose the downhill route. April/May are the best months to hike to avoid the overpowering summer heat and the rainy autumn weather that can sometimes cause the gorge to close. The easiest way to walk the gorge is to join a tour in Chania, which can be booked at any hotel or travel agency the day before. The tour (minimum time 12 hours) will include all road transport for the day and the ferry ticket, but no meals. Departure times vary, but the earliest (which avoids the largest crowds) leaves around 6am. The coach will stop at a guesthouse restaurant in Omalos just 3 kilometres from the village of Xyloskalo on the plateau, where breakfast or provisions can be purchased. At the end of the walk, hikers catch a ferry to Sougia, where buses will take visitors back to the car park at the gorge head, an hour’s drive away. In the late afternoon the bakery in Sougia doubles as the KTEL bus ticket agent. The lady in charge of the bakery organises, with commendable military precision, the evacuation of all tourists who need a ride. 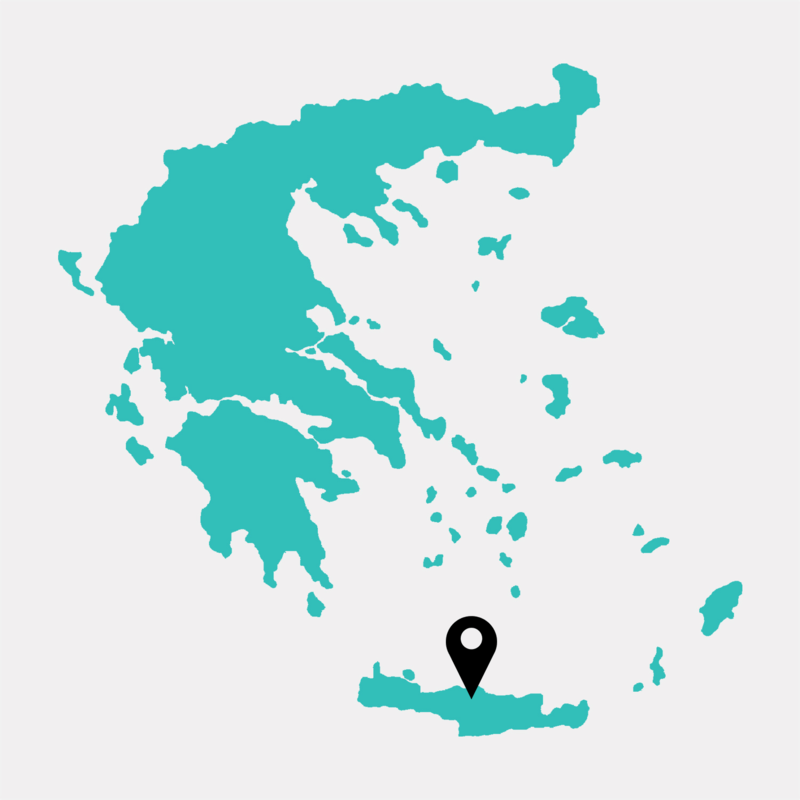 If arriving by car, an overnight stay in one of the few guesthouses — such as To Ellinikon — in Omalos village is advisable. The White Mountains taverna in nearby picturesque Lakki has reasonably priced excellent cuisine and wine, and is worth visiting for the views alone. There is a free car park at the gorge head and a reasonably priced café that is open early enough to catch the very first hikers. For those with more time and a penchant for solitude, rather than taking the afternoon ferry at the end of the trail, visitors can enjoy an overnight stay in Agia Roumeli. 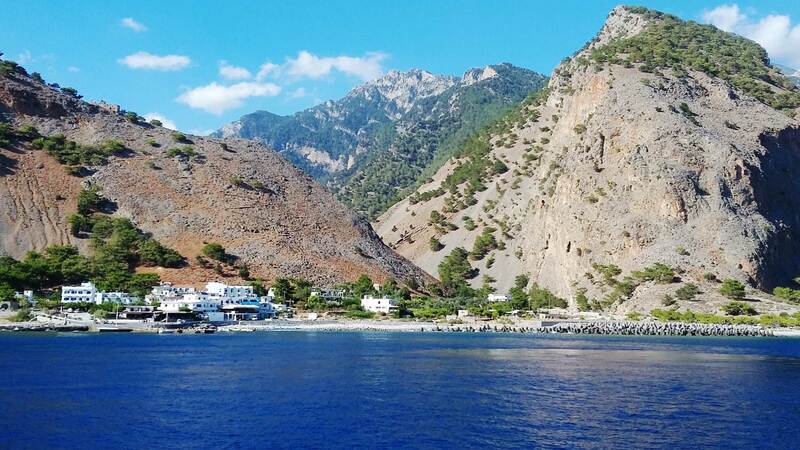 Once the day’s hikers have left, Agia Roumeli is restored to a tranquil fishing village, accessible only by sea, where an evening meal can be enjoyed under the stars on the waterfront. Hiking essentials: a refillable one litre water bottle, sun cream and a hat, food and energy snacks, a basic first aid kit, and warm outerwear for the start of the trail, as it can be very cold in the early morning at 1230 metres above sea level. An even pace is recommended, especially over the first two kilometres of the walk where the path is very steep and the stones are worn smooth in places. This is where most accidents happen. Entry to the park costs 5 euros for those over 15 years old. The ticket must be retained and relinquished on exiting the park (to ensure a safe exit for all visitors). Lighting fires is prohibited and smoking is not allowed anywhere in the park except in the recreational areas. If medical attention is needed, contact a ranger. There is a helipad at Samaria village for the rare cases of emergency evacuation. Dogs are permitted but must be strictly kept on a leash at all times. From Chania, it is possible to arrange a private guided tour, or the ‘easy gorge walk’ involving a boat trip both ways. The Anedyk Ferry website contains useful information in English. The KTEL bus website contains useful timetables in Greek.